Last week my little family traveled to Colorado to spend a week with my sister in law and I was able to unveil their house warming gift! They bought and moved into their first house last spring and I’ve been plotting a home warming gift for a couple of months. But what fabric to use? Something geeky? Something traditional? 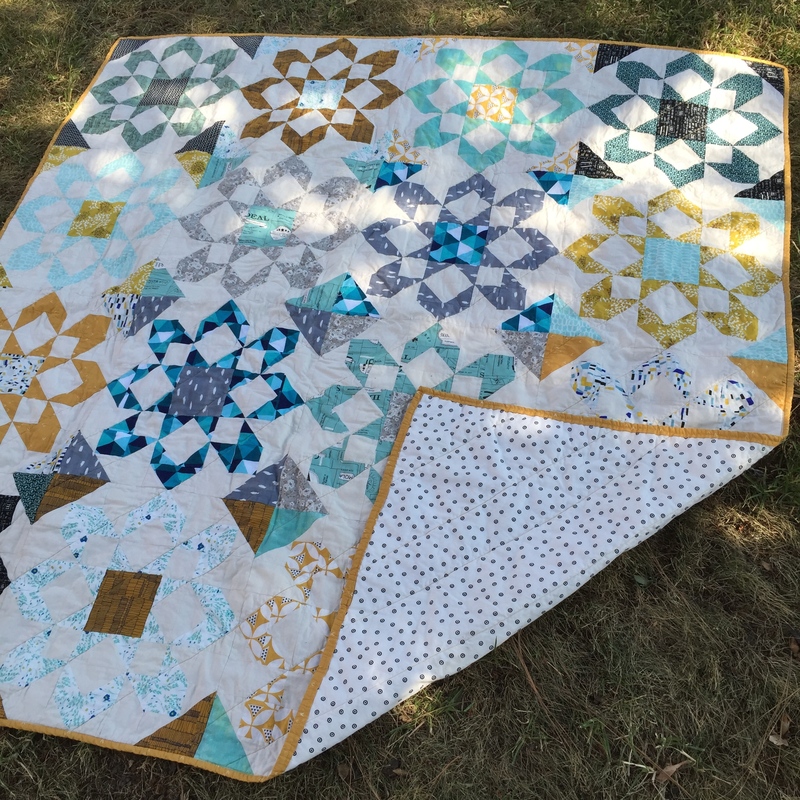 Well, after finishing my husband’s quilt, we looked at the other half of the collection and my husband requested I use it for his sister. Sold! So the front of the quilt features the magenta/orange colorway of the Franklin by Denyse Schmidt collection. Gah! I love this collection. So classic. So pretty. But what pattern to use? 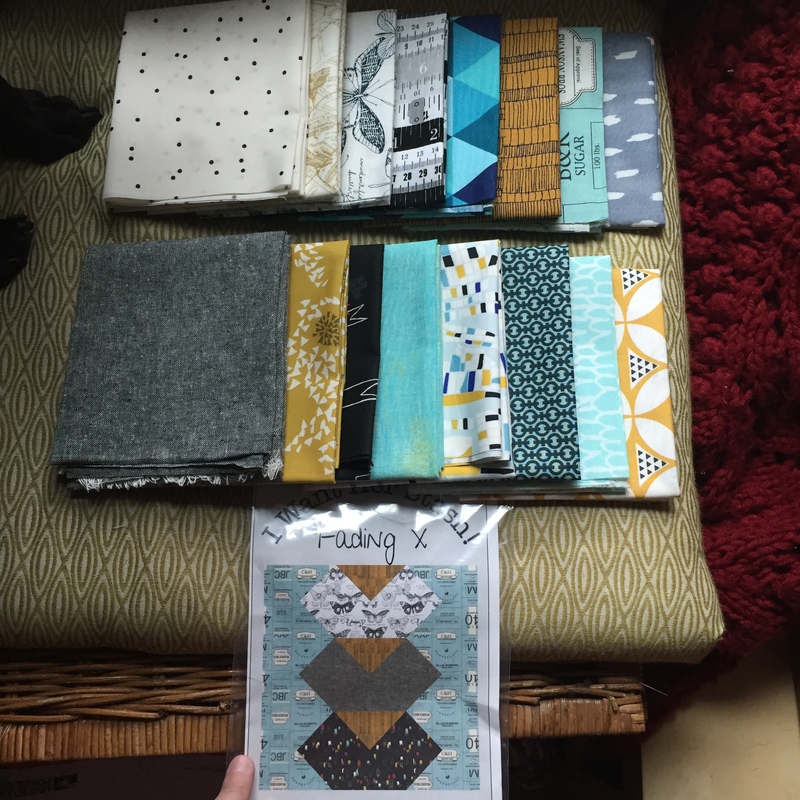 We scoured my favorite sites and decided on Suburbs from Cluck Cluck Sew. I mean, it seems like a natural fit for a house warming gift, no? However those houses did present a conundrum. 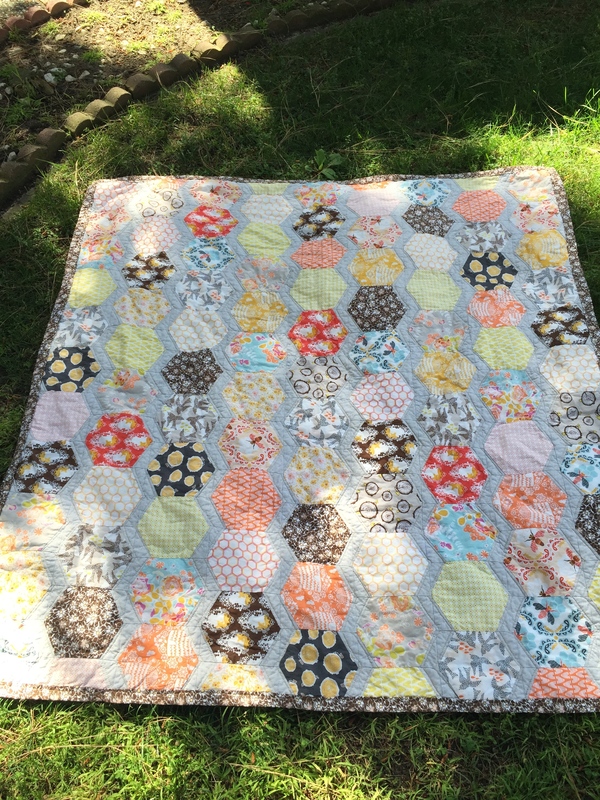 I do all quilting on my little home machine. It’s a good machine, but not one I’d use to do a heavy overall quilt pattern. 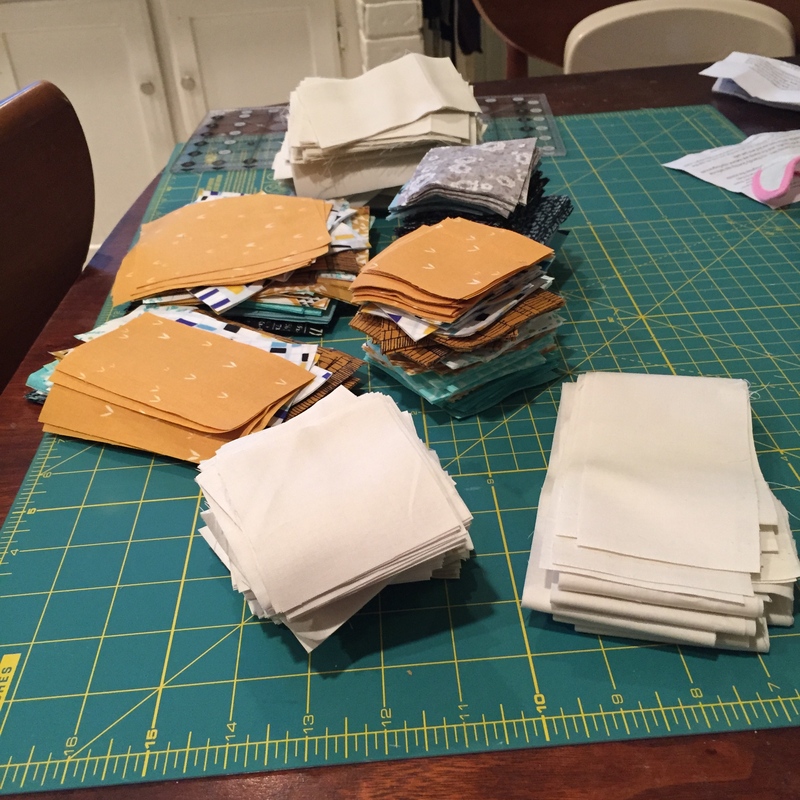 And I had this idea of quilting around each house, but then there are all these blank squares that need…something. Just deciding on how to fill those spaces took a couple of weeks. I was stumped. 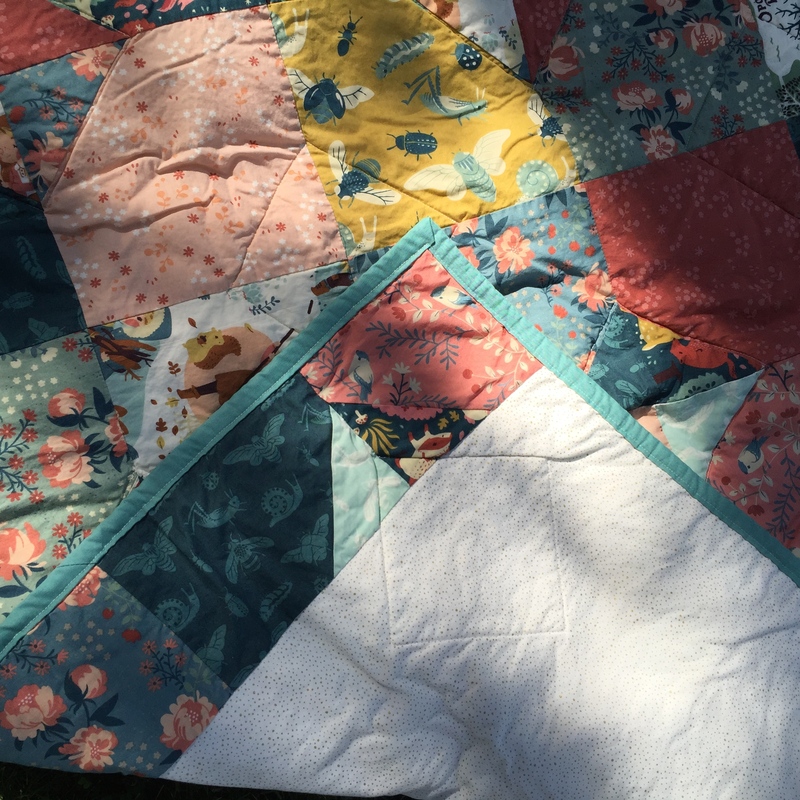 Eventually I decided to do a combination of machine quilting and hand tying the quilt. I had grand visions of hand quilting trees, and their monogram, and clouds, and a bunch of other stuff. 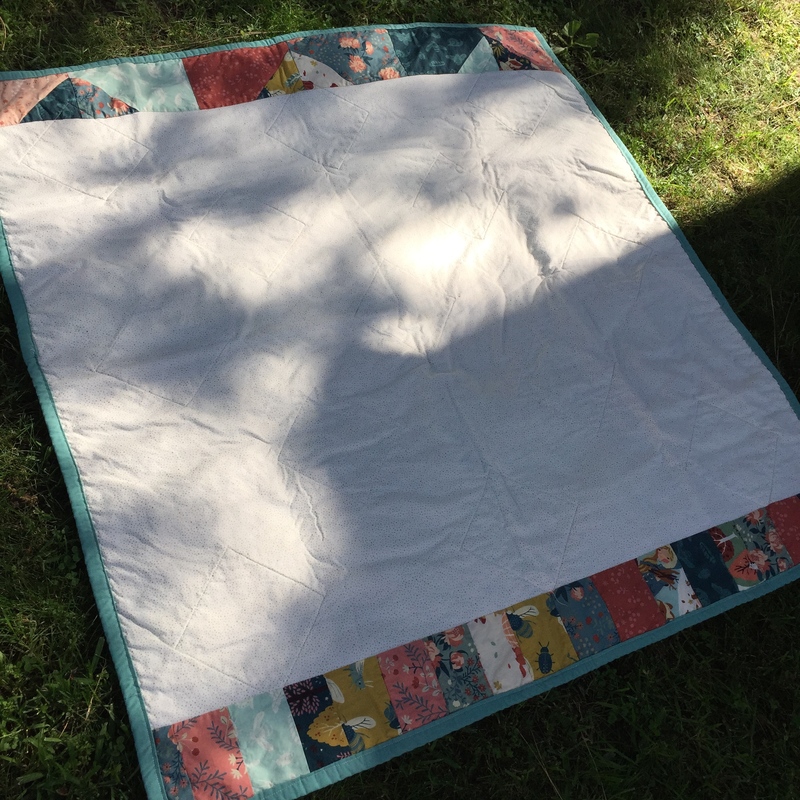 But in the end the simplicity seemed to fit the quilt and my sister in law’s family much better. But the back of the quilt. It’s my favorite part. 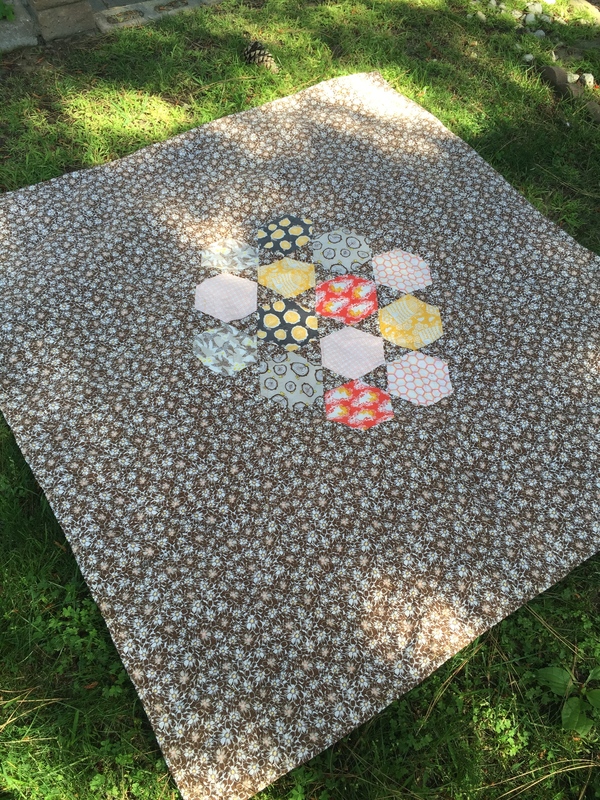 The backing fabric is from Natural History by Lizzy House. I love the way the homes look like they are in the middle of a night sky. A big night sky like you might encounter someplace like Colorado in the summer. Of course the week of our visit was rainy and stormy, so no star viewing for us, but that’s okay. This California girl was happy for the rain. Too bad I couldn’t bring it home with me. And my sister in law? She loves the quilt! 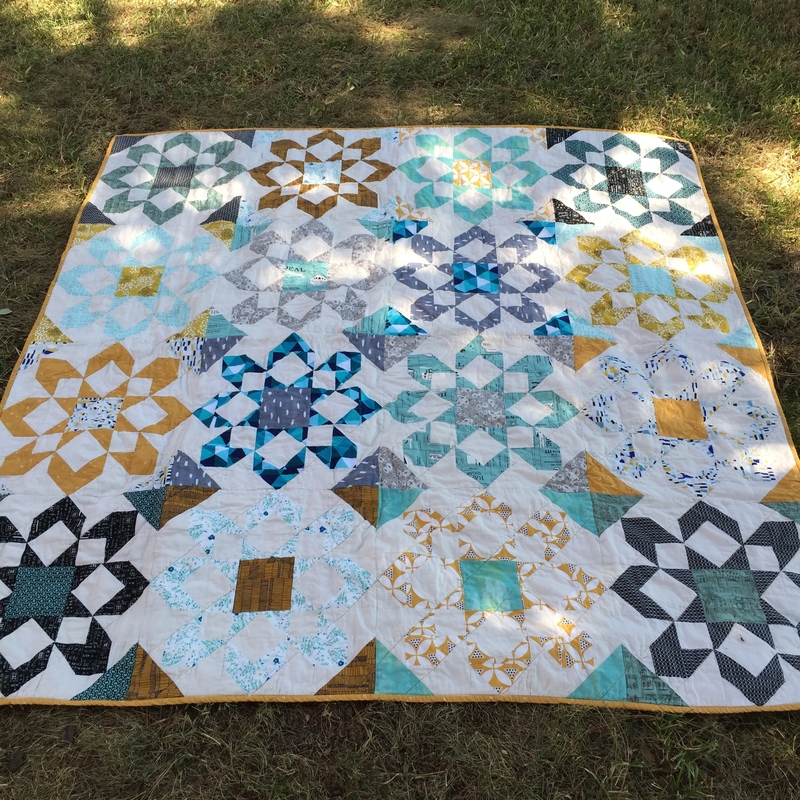 Now that I’ve shown you my sister’s quilt I can also show you another gift quilt. 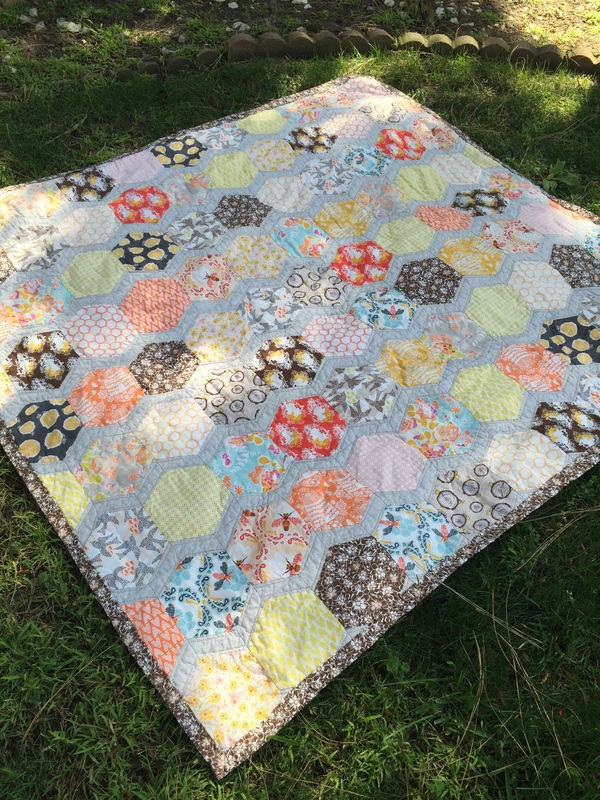 A quilt for a wee baby girl. 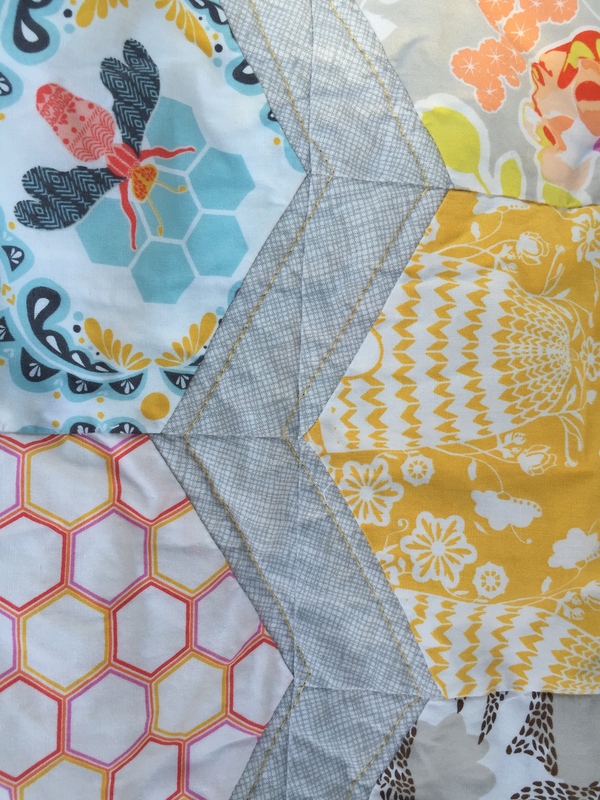 This quilt at first suffered from indecision. 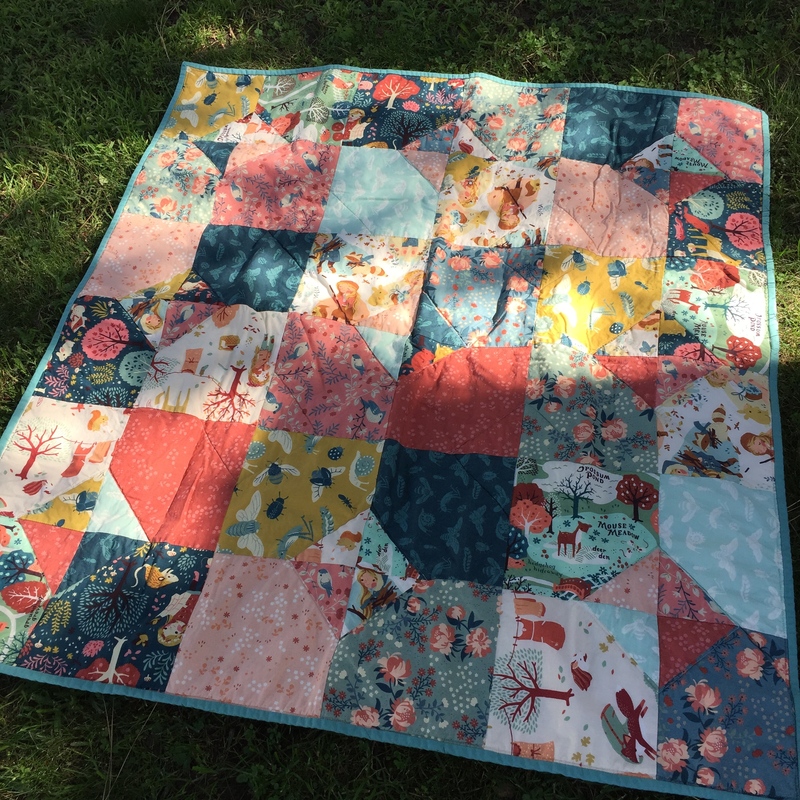 You see I bought the fabric, Acorn Trail from Birch Fabrics, on a whim. One of those fabrics I just couldn’t ever forget, so I just went ahead and bought the collection. So when I decided to make a quilt for my sister at first I thought this would fit the bill. But something didn’t seem right. 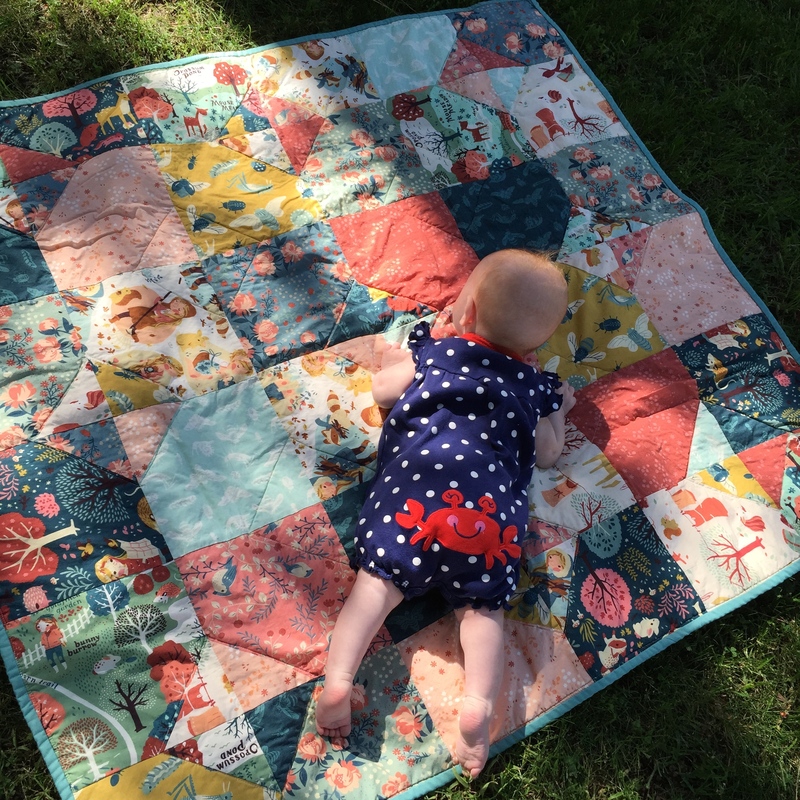 As I worked on the quilt using this tutorial, I realized it was perfectly sized for a baby. Perhaps a baby who has a woodland themed nursery? Yes! Yes, that is a good idea and I knew of such a person. A knitter friend who is due to have a baby this summer. Suddenly everything clicked into place! 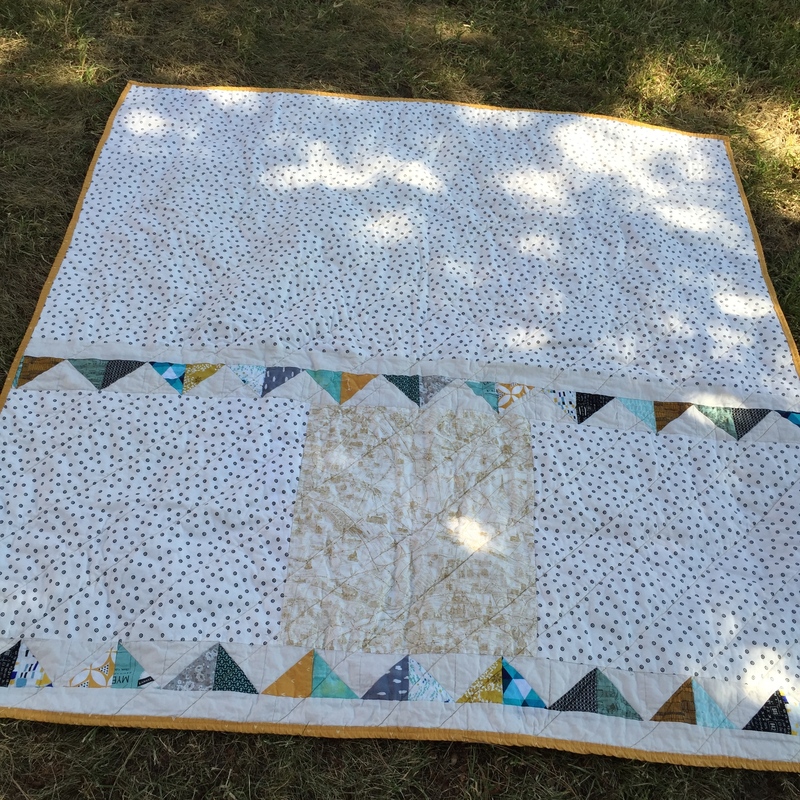 Diamond shaped quilting to match the piecing on the front. Scraps to help fill in the white with gold dot backing. It all works perfectly. And in the end I love this quilt so very much. 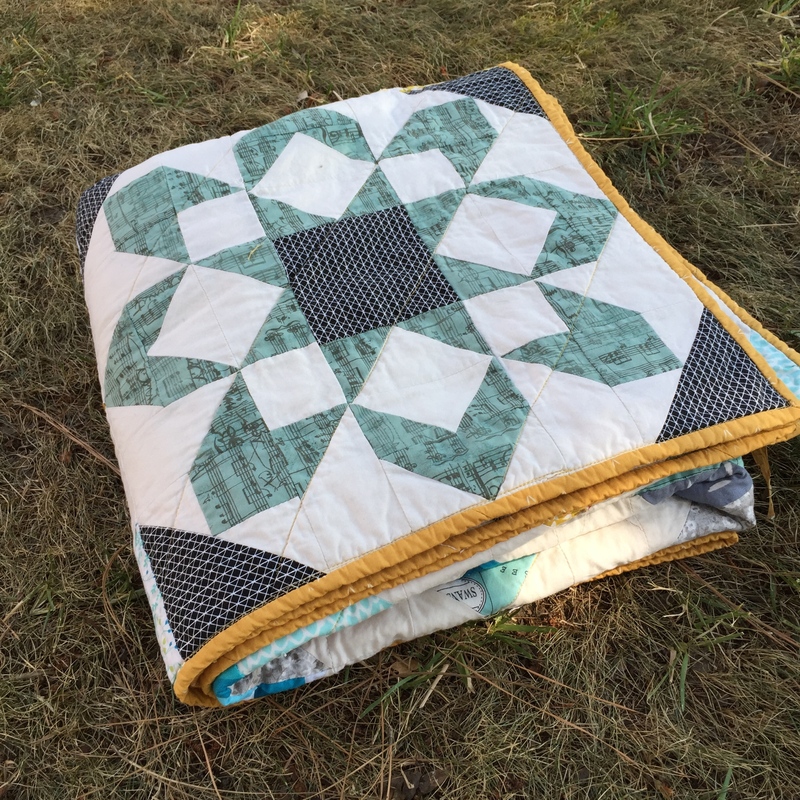 It has gone to its forever home now and I have it on go authority that this quilt will be loved. As it should be.